ORTELIUS - Descriptio Germaniae Inferioris. ORTELIUS, A. - Descriptio Germaniae Inferioris. Descriptio Germaniae Inferioris. - ORTELIUS, A. Title : Descriptio Germaniae Inferioris.. Size : 14.8 x 19.9 inches. / 37.7 x 50.5 cm. Description :The oval map is surrounded by a strapwork frame and the title, adorned with ribbons, is held aloft by two winged cherubs. 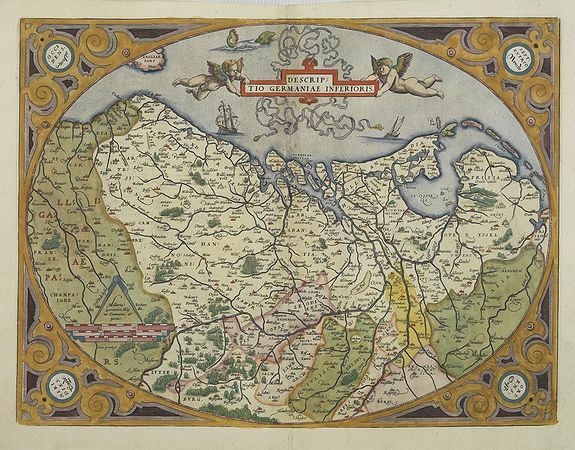 Ortelius based this and several other maps of the Low Countries on Jacob van Deventer's maps. Condition : Repair of split lower part centre fold, 4,5 cm into the image. Paper slightly age toned. Upper margin cut along border frame, as issued. Good condition.